A group of students during my research study inspired me to rap. If they can learn English by rapping I can rap too! Over 10 months ago the idea of music in ESL began stirring up a whirlwind of ideas, questions, and confusion in my head. As my graduate thesis proposal approached last spring, I finally settled on the idea of researching student and teacher perceptions on the use of music to enhance second language acquisition in adult ESL classrooms. My research question is directly related to my omoi and I have been a musician all of my life. My major was in ethomusicology, specifically piano performance and world music cultures. I played in a gamelan for 2 years during undergrad, and traveled to Ubud in central Bali to experience Balinese gamelan at the heart. As an educator, I have always wondered about the power of music in ESL, and what music's place is in the field of education and more specifically ESL. Never having the flexibility in my previous work places to use music freely in my lessons made me wonder how other teachers are currently using music in ESL. I want to learn from them and see how they are using music, why, the effects, and what the students think. The exact whereabouts about the first implementations of music within academic subjects is unknown. However, integration of music with academic subjects is by no means a new notion in the field of education (Sporborg 1998). Teachers have been using music to teach academic subjects in science, mathematics, geography, history, and language arts throughout the 19th century. Of the most famous examples and one that remains famous today, is introducing the alphabet to young children by singing the letters to the tune “Twinkle, Twinkle, Little Star” (Sporborg 1998). There is an abundance of theory and research that supports the use of music in educational contexts. Gardner's theory of multiple intelligence's shows how musical intelligence could explain the ease that some learners have in perceiving and producing the intonation patterns of a language (Brown, 2007). A current empirical study shows the effectiveness of using music to teach math concepts in San Bruno, California. (Esch, 2012) Music has been shown to improve communicative skills among middle school ESL students (Kennedy & Scott 2005). However the overall phenomenon of music in ESL has not been deeply studied. The teacher perceptions have not been recorded in detail and most research focuses on the students. As I’m in the final stages of collecting my data, I was inspired by a group of students that I was researching. While observing one particular class that was using music as a means of discussion and a writing activity, a group of students openly talked about their enjoyment of listening to music to improve their English skills. Several students began rapping to their partners and their groups egged them on as they busted out the lyrics. The student really sounded American while he was rapping, and I’m sure that he influenced his fellow students to start singing in English to improve their pronunciation, vocabulary skills, and overall fluency. I’m sure this particular student didn't know, but he inspired me, and as I drove home that day I turned on my I pod to some of the only rap that I had and started learning the lyrics. 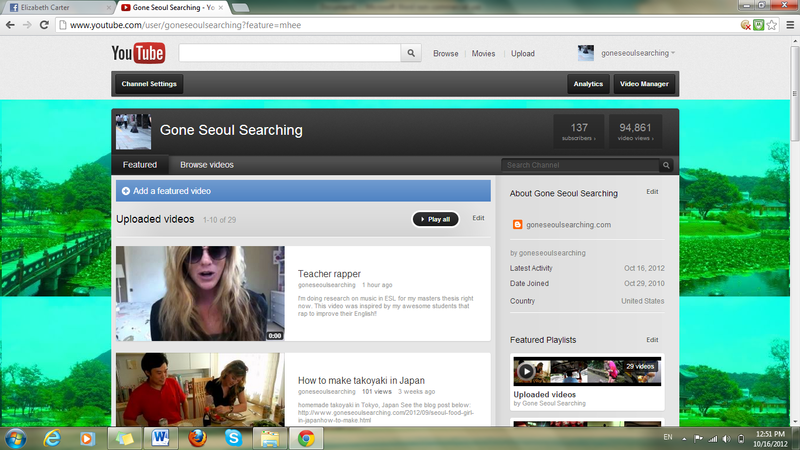 So my “teacher rapper” video is dedicated to all of the students out there learning English through music. Rapping in class sounds great... but I find it difficult to find kid-friendly raps. One of the biggest findings is that it has to be used purposefully, not as a gimmick! Here is a cute song for kids!